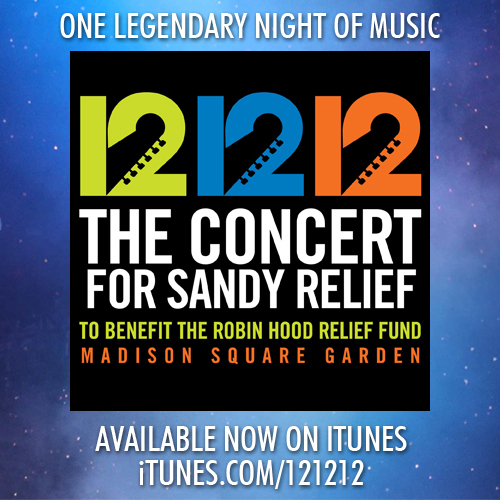 121212: The Concert For Sandy Relief was an undoubtedly historical evening of music reaching over 2 billion people around the world. Now you can own the musical highlights from the night including Bruce & The E Street Band's performances of "Land Of Hope And Dreams" and "Wrecking Ball" plus 22 additional tracks from Roger Waters, Paul McCartney, Billy Joel, The Who, Rolling Stones, Chris Martin, Alicia Keys and many more special guests. Click here to download now on iTunes and proceeds from the album will go to the Robin Hood Relief Fund, which is providing money, material and know-how to local organizations that are serving families and individuals in the regions hardest hit by the storm.